A recent assessment conducted by the Women’s Refugee Commission in Haiti found that the price of charcoal has risen by 40% (WRC and WFP 2010). Helping subject populations to develop the capacity to produce liquid biofuels may offer one important solution to energy poverty in Haiti’s displaced communities and contribute to its long term development of energy self-sufficiency. 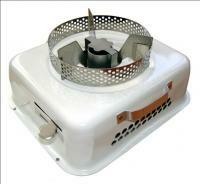 Project Gaia has been working in Haiti to promote ethanol and the CleanCook Stove - an alcohol based stove - as an alternative to stoves that burn solid biomass (i.e. wood, charcoal, and briquettes.) Ethanol is as clean as LPG, cheaper than charcoal, safer than kerosene and has greater potential than trash briquettes. In Africa, Project Gaia has accumulated over 2 million days of cooking with the CleanCook Stove without a single accident of any significance. This is the key sustainability question and the reason why we are so interested in Haiti. Not only was Haiti once a leading sugar producer and a distiller of beverage ethanol for export as well as the local market, but also Haiti exists on trade routes over which billions of liters of ethanol flow each year on their way to a fuel market in the United States. This ethanol, mostly from Brazil, generally the most competitively priced in the commodity market, will provide a source of fuel for Haiti—cheaper than kerosene—as Haiti builds up its own local production (Ethiopian Petroleum Enterprise Data). In fact, the Brazilian Government has pledged to donate over 100,000 liters and an additional 400,000 liters over the next two years. Haiti was once a powerful agricultural economy, producing for its own needs. 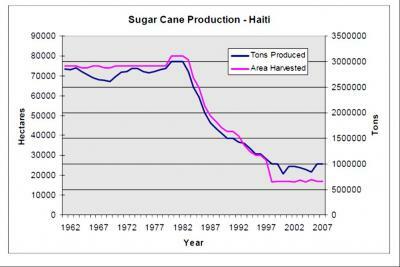 In 1983 Haiti harvested 70,000 hectares of sugarcane. Today it harvests less than 17,000 hectares (Figure 1: Decline in Sugar Cane Production (UN Data World Statistics Pocketbook)). Haiti’s dependence on export markets has increased its vulnerability through its reliance on basic sustenance items it once produced locally. Today it supplements most of its own food staples with imports – a precarious equilibrium. Other than charcoal, most other fuels are imported. In regards to domestic ethanol production, Haitians are no strangers to the distillation of alcohol. Thousands of small mills and distilleries make beverage-grade ethanol in Haiti. In Léogâne alone, over 200 small distilleries were in operation before the earthquake (ESMAP 2007). Many of the existing distilleries in Haiti, those shut down or still in operation, could be repaired and refurbished to produce fuel grade ethanol. Project Gaia has been in contact with an operating distillery in the vicinity of Léogâne that could upgrade to produce hydrous ethanol fuel and put this fuel into the market in a matter of months. Haitians rightly believe that Haiti’s way back from dependency is through agriculture and a renewed attention to domestic needs and markets. Therefore, by developing ethanol as a household fuel, it will profoundly benefit Haiti because Haitians can produce biofuels from their own agricultural crops. Moreover, Haitian families will finally have access to cooking fuel that is safe, clean, affordable and sustainable. A way back to economic - and human - health for Haiti is to produce ethanol for its domestic energy market.